I was listening to the latest vSoup podcast (#53) yesterday and it crystallised my thoughts on the availability options of vCenter that I have been ruminating about over the last few months. Those of you who use VMware products extensively know that vSphere is the bedrock of the entire VMware eco-system. Without the simplicity, reliability and performance of vSphere, it all collapses like a house of cards in a light breeze (read vCAC, vCAD, vCD, NSX, Horizon, Pivotal, etc.). So why is vCenter Server still so complicated? VMware are moving in the right direction with increased configuration limits for the vCenter Server Appliance, but they still have a long way to go. vSphere HA – Host, VM and App protection – provides better than three 9s of availability, albeit with a vCenter restart and protecting yourself during upgrades is complicated. Continue to use vCenter Heart Beat (assuming you already own it – End of Sale 06/14, End of Support 09/18) – better than four 9s of availability, expensive and complicated. Buy Neverfail to protect vCenter (this is under the hood of vCHB) – same comments as previous point. Use Microsoft Clustering, Microsoft SQL Server 2012 Always-On (DB protection) or Veritas Cluster Services (VCS) – better than four 9s of availabilty, but complicated and expensive! (Disclaimer – I have never used VCS). Protects me during planned and unplanned downtime (particularly during upgrades – I always maintain the latest ESXi patches, but my vCenter Server patches always lag more than a year behind because I cannot upgrade vCenter without downtime and risk, I want to maintain the latest vCenter Server Patches as well as ESXi). Provide better than five 9s of availability for the vCenter service. Bottom line: I do not want to install and configure an Operating System, Database, vCenter Server or Clustering software. I want a virtual appliance with a Web Interface that has point and click functionality. I want you to apply what you did with Virtual SAN and EVO to vCenter. Included under the vCenter Server Standard licence. vCenter Server Appliance becomes the mainstream choice for deploying vCenter Server. vCenter Server Appliance supports the configuration maximums of vSphere. 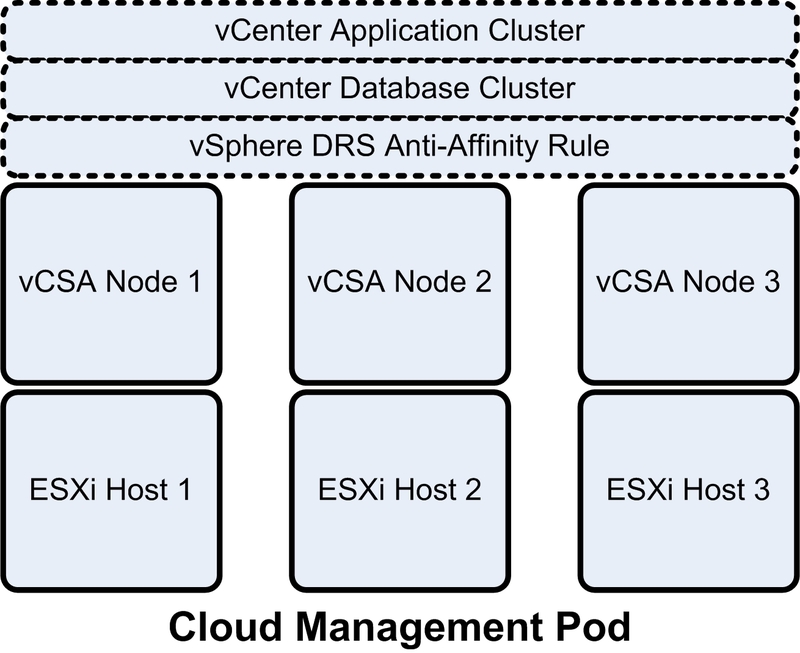 vCSA supports 1+1 and 1+2 clustering scenarios (for 2 host and 3 host cloud management pods). vCenter Application & Database clustering natively supported and completely under the hood. Including an elegant protection method against Database corruption and an upgrade rollback button. Active-Active clustering is preferred, but Active-Passive clustering is acceptable with point and click switchover with a few seconds of interrupted service. The ability to place a clustered vCenter Server Appliance in “Maintenance Mode”. VUM, SRM and Linked Mode must be supported. “vCenter-as-a-Service” from vCloud Air – the vSoup guys mentioned it, sounds cool, so here it is. It will be interesting to see what the move on acquiring Continuent was for? It could it be we will see all backend database for VMware products moved to MySQL and Continuent clustering, reducing cost and reliance on other vendors Dbs and solutions?.